This is a brief account of the history of No 9 Commando from its formation in the summer of 1940 to disbandment in 1946. It was most heavily involved in operations around the coasts of Italy, Yugoslavia, Albania and Greece. On the 10th of May, 1940, Churchill replaced Chamberlain as Prime Minister and almost immediately was faced with the evacuation of 330,000 troops of the expeditionary force from Dunkirk. On June 4th, as the last of the troops were on the way home, Churchill sent a memo to his Chiefs of Staff that would lead to the formation of the Commandos and the Combined Operations Command. While everyone else was planning the defence of the country against an invasion, the Combined Operations Command would concentrate on planning for and undertaking offensive operations. Two days later he elaborated: Enterprises must be prepared with specially trained troops of the hunter class, who can develop a reign of terror first of all on the 'butcher and bolt' policy. I look to the Chiefs of Staff to propose me measures for a vigorous, enterprising and ceaseless offensive against the whole German occupied coastline. In response to Churchill's urgent requests, on June 14, 1940, Lieutenant-General Alan Bourne was appointed by the Chiefs of Staff to the new position of "Commander of Raiding Operations on coasts in enemy occupation and Adviser to the Chiefs of Staff on Combined Operations." Bourne was a well respected and capable Royal Marine Commander with experience of both land and sea operations but, on learning of his appointment, Churchill wanted a person of much greater stature and experience. At his behest, on the 17th of July, 1940, Roger Keyes replaced Bourne and was appointed to the strengthened position, certainly as viewed by Keyes himself, of Director of Combined Operations. Meantime, independent Commando units had been formed, which undertook courageous but largely inconsequential raids on Boulogne and the Channel Islands. Churchill was not impressed with these pin-prick raids and over several months their recruitment, training and deployment were better defined and developed. These deliberations resulted in the formation of Commando Units in the first few weeks of July, 1940. Some of the Units had a distinct geographical base as Army volunteers came forward. Nos 3 and 4 Commandos were formed from Southern Command, Nos 5 and 6 from Western Command, No 7 from Eastern Command, No 8 mainly from the London District and the Household Division and Nos 9 and 11 from Scottish Command. No 1 Commando was formed from disbanded Independent Companies, whose members were trained to fight independently as irregulars and not as part of a formed military unit. Initially designated the No 1 SS Battalion by March 1941, it was renamed No 1 Commando. Their CO was Lt Col John Maclean (Jack) Saegert, RE and their HQ was at Criccieth in North Wale. Unless otherwise stated SS in this article denotes 'Special Service,' not to be confused with the German SS. In July, the possibility of Spain entering the war on the side of the Axis powers was a growing concern. Contingency planning for the invasion of the Canary Islands was implemented with the purpose of denying the enemy a naval base from which they could threaten Allied shipping in the Atlantic approaches to the Mediterranean. The operation was codenamed 'Puma', later changed to 'Pilgrim'. The force comprised two Royal Marine Brigades, Army troops and Commandos. They were assembled at Inveraray under Major General Robert Sturges of the Royal Marines. The Commando element comprised Nos 1, 2, 4, 9 & 12. Command of Force 110, as it became known, was transferred to Lt General, Sir Harold Alexander the GOC of Southern Command. Part of the force was sent to Freetown in Sierra Leone and then Lagos in Nigeria to undergo amphibious training in topographical and climatic conditions similar to the Canary Islands. The Commando contribution to the Force comprised four small parties of one officer and 25 other ranks, including one drawn from No 9 Commando. However, by February 1942 the risk had subsided and they returned to the UK. On the night of November 22/3, 1941, under the codename 'Operation Sunstar', a troop of 100 men from 9 Commando set out to attack a 4 gun emplacement east of Houlgate on the French coast south of Le Havre. They came ashore a few hundred meters from their intended landing beach and were unable to press home their attack because of an intervening clay cliff. Pte J Davidson, a bren gunner in the cover party, who stayed aboard the 2 LCAs involved, recalled that the troop had stayed aboard the Princess Beatrix for a couple of weeks before the mission. They were issued with 1000 French francs and escape rations. As the LCAs beached, one 'broached to' (sideways on to the beach) and was towed off with difficulty. Initially, there was no sign of the enemy but soon Very lights and search lights lit up the area, while trucks were seen approaching from 3 or 4 miles away. The raiders still on the beach swam towards their LCA after exchanging torch signals with the cover party. The LCA gunners withheld fire to avoid giving away their position. Meantime another Commando party, having called at a farmhouse to be told of an imminent 2 man bicycle patrol, set a rope across the road to dismount them. No sooner had this been done when a Stuka aircraft attacked the LCAs, by which time Pte Davidson's LCA was filling up with water and only one engine was working. However, on the second strafing he managed to put two bursts into the plane. It did not return and may have been disabled or shot down. This version of events differs from some records of the operation which report a successful landing and that the raiders had insufficient time to carry out the intended raid. The Commandos suffered no casualties but the raid proved the need for better planning and execution. Early in November 1942, No 9 Commando, under Lt Col Ronnie Todd, was on the periphery of Operation Torch when they were sent to Gibraltar to reinforce the garrison there. There was concern that the Axis forces might move through Spain in retaliation for the Allied invasion of North Africa. The Commandos returned to the UK in early March 1943 to be replaced by No 3 Commando. In the autumn of 1943, No 9 Commando was despatched to the Mediterranean to be joined by No 43 (RM) Commando in Nov, 1943, after they had completed their training. No 9 had been operating around Molfetta on the east coast of Italy since November 8. A week later they carried out reconnaissance on the small islands of Tremiti and Pianosa to the north but found no evidence of the enemy on either. At the end of November, they moved to Naples on the west coast of Italy, coming under the command of the US Fifth Army. The Germans had established a defensive line on the Garigliano and Rapido rivers. A plan to force a crossing of the Garigliano, near its mouth, was abandoned in favour of a similar operation, but this time a feint, designed to keep the German forces occupied in the west. No 9 Commando were given three objectives by X Corps: a hill called Monte d'Argento about 2000 yards NW of the river mouth; the destroyed bridge carrying route 7 over the river and a spit of land NW of the river mouth, which separated it from the coast. The three objectives formed a triangle and Lt Col R J F Tod planned to land his men half way along the shore side of the triangle then divide the force into three, one for each objective. Since the operation was a feint, they would withdraw across the river to their home bank once the positions had been taken. Before the Commando action, the enemy positions on their home bank were to be softened up and subdued. They had a rehearsal on the night of the 27/28 December, 1943 on their home bank and on the evening of the 29th, they embarked HMS Royal Ulsterman and Princess Beatrice with their Landing Craft Assault (LCAs) securely attached to davits for lowering the Commandos into the water a few miles off the landing beach. On the 30th, they learned that most of the enemy had been cleared by the 167 Brigade and the Guards Brigade. The task ahead would now be quickly concluded. About 6 miles south of the landing beach, opposite friendly shores in Allied hands, the LCAs and the Commandos were lowered into the water. They formed up and set course for the landing beach, in darkness, at 21.30 hrs. Inaccurate navigation by the accompanying US Navy craft would have placed the raiding party 2 miles SE of the river but Tod became aware of the error and advised his 2nd in command, Major E W Clark. They altered course and landed about 700 meters NW of the river mouth at 0035 hrs. This was about 1000 meters short of the intended beach and 90 minutes later than planned. There were no distinguishing features on the coastline, which was, in any event, difficult to see. One LCA developed a steering fault and did not land. The three raiding parties were reorganised and by 0100 hrs they had accurately established their position on the coast. Y force, comprising 120 men from Nos 1 & 2 Troop, was under the command of Captain J McNeil. Their objective was the hill feature. Progress was slow due to the extra distance, irrigation ditches, mines and wire but they reached their objective after 2 hours. They split into two troops, one to attack the top of the hill and the other to clear the houses and to block the road to the north. The hill was defended mainly by mines and booby traps with the enemy concentrated to the north. The troop searched the lower ground and blew up a PzKw Mk III Special tank found in a cave. In the action, they killed six enemy and captured four at a cost of four casualties to themselves. Their route back to the beach took them close to No 6 Troop's 'bridge' objective. As they approached they heard the unmistakable skirl of bag pipes playing the 'Pwbrrachd of Donald Dubh'. McNeil then ordered his piper to play his Troop's march 'Green Hills'. The two Troops subsequently met up without firing a single shot each other. No 9 and No 11 Commando were originally formed as Scottish Commando Units and each Troop had its own piper which proved invaluable in this action for locating and rallying the men. Captain Cameron, who led Z Force comprising Nos 4 and 6 Troops, also found progress very slow, arriving at the bridge at 0500 hrs. With the support of artillery, they overran a pillbox and suffered no casualties. 201 Brigade advised that the home bank near the bridge had been cleared of the enemy but Cameron had his doubts. They rigged up a toggle rope to bridge the two 15 foot gaps in the road bridge and made there way across, where they took a number of German prisoners. X Force, meantime, had swept through the spit taking one prisoner but suffering 5 casualties to a mine. They joined up with Y Force and returned to their home bank at 07.30 hrs in American DUKW amphibious wheeled vehicles. 9 Commando lost 9 men and suffered 21 wounded in the operation but they killed 16 enemy and took 28 prisoners. As intended, Operation Partridge persuaded the enemy to reinforce this part of the front line to the betterment of operations in other areas. A plan to drop parachutists on high ground overlooking the planned landing beaches at Anzio was set aside in favour of an overland assault. The objective was to deny the elevated position to the enemy. On the morning of January 20, 1944, No 9 Commando with 43 (RM) Commando boarded HMS Derbyshire. They sailed with the rest of the fleet, arriving off the beaches on the night of January 21/22. They made the shore without difficulty but sustained a few casualties from an early morning aircraft attack. Each man carried 70 lb of equipment and supplies with additional material carried in a number of heavily laden handcarts. They occasionally ran into enemy patrols but their slow progress was mainly due to mud. Both Commandos were in position for the main assault by 1330 hrs. They attacked from the NE and W and by 1430 hrs they were securely on the high ground. Next morning the US Rangers took over their positions and the Commandos were placed in reserve before returning to Naples on an LST (Landing Ship Tank), arriving there on the morning of the 25th January. It had been a relatively easy operation but Anzio had not yet earned its dreadful reputation for fierce fighting. No 2 SS Brigade, of which No 9 Commando was part, was placed on a state of readiness for further action at short notice. Initially No 9 and No 43(RM) Commandos were to join No 40 (RM) Commando to form part of a counter-attack force. However, General McCreery, the Commander of X Force, decided that Nos 9 and 43(RM) Commando would extend his foothold in the hills west of Garigliano by taking control of the three peaks of Monte Ornito - Tugo (2000 ft), Ornito (2,400 ft) and Faito (3000 ft). The terrain was rocky, uneven and in places very steep with scree slopes and there was virtually no cover. Even without enemy action, supplying troops on these summits with food, water and ammunition would involve a great deal of human effort. Transport problems and lack of sleep caused the attack to be delayed by 24 hours but the opportunity this presented to undertake further reconnaissance was not used due to thick mist and enemy shelling, which caused 16 casualties including 5 killed. No 9 Commando passed Monte Tugo and proceeded NW, where they came under heavy fire from a feature in front of Monte Faito. Three Troops overran the stronghold against heavy mortar and shell fire, causing some casualties and firing continued while the Commando consolidated and reorganised. Their advance continued still under fire, during which Tod suffered a bad injury to an arm. Major E W Clark, the 2nd in command, was killed and six other officers wounded. Against the withering fire they withdraw to Monte Ornito. Interrogation of prisoners indicated that the enemy had withdrawn to Monte Faito and a counter attack was likely. Tod was ordered to hand over command to his 2nd in command. Against such determined opposition, reinforcements were needed to continue the attack but meantime the increasing intensity of the enemy artillery indicated that a counter attack was imminent. At 1600 hours it started with No 43 (RM) Commando taking the brunt, but they succeeded in beating it off. Such was the German determination to hold on to their defensive position, it changed hands 6 times in the ensuing months before finally falling to French Goums. Anzio was not yet finished with No 9 Commando. The Allied presence in the Anzio area threatened the German lines of communication running north of Rome and Kesselring had strongly counter-attacked from the end of January. No 9 Commando was ordered back to the area with Tod once more in command. They arrived on March 2, 1944, under 167 Brigade of the 56th, where they undertook offensive patrolling. On March 10 they were advised of an imminent operation for which they had one week to prepare. It was known that the Germans used three wadis, located about 11 miles N of Anzio and 2 miles west of the main road north, as a forming up point for counter attacks. 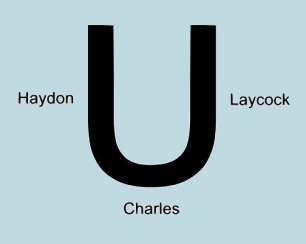 The wadis formed a U shape and each arm was given a code name (see opposite). Tod's plan envisaged a night attack on Haydon followed by Charles, which would open access to Laycock. On clearing Laycock, a defensive position would be established. Tod split the Commando into 3 'two troop' squadrons named A, B & C.
The enemy were engaged at 0200 hrs on March 19 and Haydon was easily taken by B & C Squadrons. Further machine gun fire was quickly silenced. A Squadron and Tod's HQ came under artillery fire as they moved on the wadis but they joined up with the B&C in Haydon and the action to clear Charles commenced at 0530 hrs against heavy fire, which materialised as a German counter-attack with heavy sniper fire. Tod ordered his men back to Haydon. The enemy concentrated heavy fire on their positions preventing urgently needed supplies from getting through. The evacuation of the wounded was only possible under cover of a Red Cross flag, which the Germans respected. By the time darkness approached the Germans had mounted several counter-attacks, which were beaten off, but the enemy's determination and ferocity would inflict such a high price on the Commandos, that an earlier order from 15 Brigade to withdraw, was put in train. Improvised stretchers were used to remove the wounded and Allied machine gun fire and artillery discouraged the enemy from pursuing the withdrawal too closely. No 9 Commando had lost 19 killed, 50 wounded and 4 missing in the action. The Commando was withdrawn to Anzio and, with No 40 and the rest of the Brigade, returned to Molfetta on the Adriatic for rest, recuperation and reorganisation. By May 1944, No 9 Commando was once again approaching full operational status. On the night of May 25/26, under the Command of Major M R H Allen MC, 75 men were involved in an operation to rescue Allied prisoners of war. 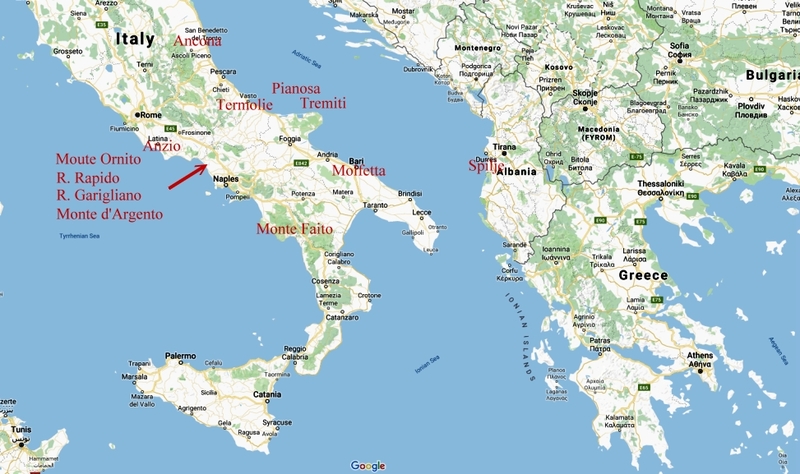 They sailed from Termoli in an LCI to a point 30 miles south of Ancona, 70 miles behind enemy held lines. They met up with A Force, who were responsible for handling escaped prisoners of war. After an initial navigating error, a US Navy 'Beach Jumper Party' guided them to the lading beach, where 120 POWs (prisoners of war) were evacuated. On Jul 28, 1944, a small party of 40 porters drawn from No 9 Commando, No 2 Commando, a company from the HLI and others were engaged in a raid on Albania, codename 'Healing II.' It was designed to open up the coastline south of the Linguetta Peninsula to supply the partisans, who desperately needed supplies. The opposing force was a 150 strong German garrison at Spilje. However, a combination of events conspired against the raiding party. Albanian Quislings had alerted the Germans, so the element of surprise was lost, radio communications were adversely affected by surrounding trees and well placed machine gun nests took an increasingly heavy toll. With time running out, the Commanding Officer, Colonel Fynn, withdrew his exhausted men, including the 60 wounded. 20 men were killed in this action. However, the result was better than had first appeared. Many of the German defenders had been killed and wounded, together with a number of Quislings. The garrison strength had been weakened to such an extent that local partisans had rounded up the remaining Germans taking control over the coastal strip in the area. Brigadier Davey, in a note to Colonel Fynn, considered the mission a 'complete success' notwithstanding the casualties. In August 1944, Operation 'Gradient I' was designed to disrupt enemy shipping in the northern Adriatic by destroying a swing bridge between the islands of Lussino Piccolo and Lussino Grande. This would cause enemy vessels, plying their trade between Istria (Rumania?) and Yugoslavia, to take a longer route and, in the case of ships travelling south, would put them within the range of Allied naval forces at Ancona on the Italian mainland. 109 men from No 9 Commando left Ancona in 3 MTBs and 1 MGB. One party was to seize and destroy the bridge, while a second, using bicycles for transport, was to destroy a local garrison. The operation took place on the night of August 9/10, 1944. There was no opposition at the bridge, which was destroyed and two Italian guards were taken prisoner. When the Commandos failed to locate the local garrison, they destroyed the local telephone exchange and returned with documents and some civilians for questioning. On the way back to Ancona, a grateful American pilot was picked up after spending a week adrift in the Adriatic. Another account, which may relate to the same operation, states... A raid by 109 Commandos on the bridge joining Cherso and Lussino Island and the Fascist HQ at Nezerine (40 miles NE of Zadar) was successful against no real opposition. No 9 Commando were tasked to destroy a German radar station at Kythira on the southern tip of Greece. A reconnaissance party parachuted in on the night of 10/11 September, 1944, to discover the Germans had pulled out the day before. The decision was taken to establish a naval base at Kapsali and No 9 Commando were landed on the island on the 17th September and stayed in Greece for nearly 6 months, making up the bulk of Foxforce. Foxforce also included elements of the SBS (Special Boat Section), LRDG (Long Range Desert Group), the Raiding Support Regiment and later some Sappers and 350 men of the Greek Sacred Squadron. Tod was in overall command. His orders were to guard the naval base at Avlemonas on the eastern end of the island and later Kapsali on the SW corner, where weather and infrastructure were more favourable. However, as the Germans retreated, division amongst the various resistance groups began to surface in the political and security vacuum the German's left behind. ELAS and EAM were controlled by the Greek Communist party, while EDES were non-communist. All were against the Greek monarchy. Foxforce HQ in Kythira was increasingly the focus for the reporting of malicious stories about the three factions... by the three factions! Although diplomacy was not part of his training, Tod thought he could help prevent a civil war breaking out between the communist and non-communist forces. On the mainland, ELAS attempted to take control of towns as the Germans retreated. This was the duty of the Greek Security Battalions left behind to enforce law and order. The Allied Military Mission asked Foxforce to help and together with 70 of Tod's men, and assisted by the Swedish Red Cross, the Security Battalions were imprisoned on the Island of Spetsai for their own safety. As the German retreat continued, Tod found himself in a fast moving and changing situation. When the Peloponnese (large peninsula in southern Greece) and the island of Poros were evacuated by the Germans, the naval base at Kythira was moved to Poros for operational reasons. Before leaving Kythira, Tod secured the agreement of the Partisan leaders to uphold the Greek Government, keep the peace and not to deport any individuals or factions. 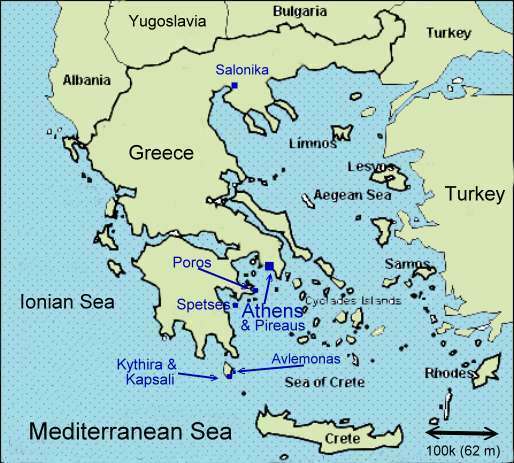 The move to Poros caught the Germans by surprise and hastened their withdrawal from Piraeus and Athens. On October 14, Foxforce landed at Piraeus after negotiating enemy minefields. They received a tumultuous welcome from the locals, who had seen the last of the Germans leave the day before. 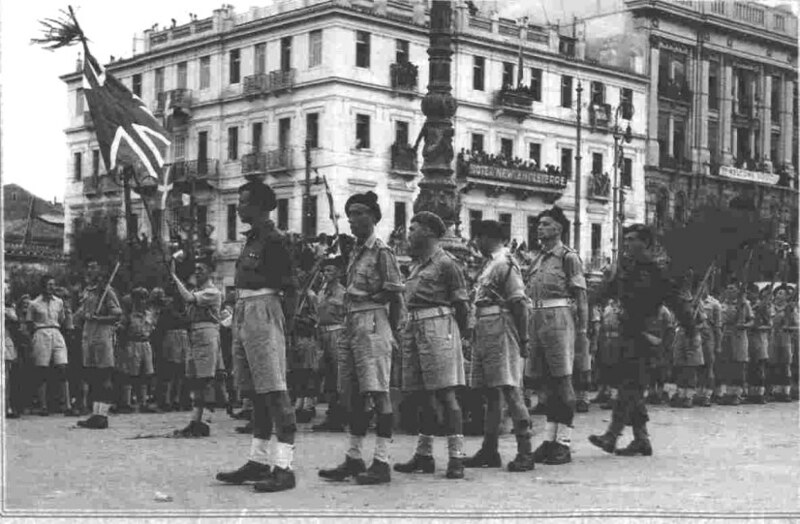 One troop provided guard duty at Kalamaki airfield, while the remainder of No 9 Commando took part in a liberation parade in Athens and Tod was made a freeman of the city. There then followed some rapid changes to Foxforce. The SBS and LRDG left Tod's command and he returned to Italy to take over 2 SS Brigade. Major M R H Allen, MC, assumed command and, at the end of October, No 9 Commando moved to Salonika, where it undertook normal garrison duties. In early December Lt Col J M Dunning-White, newly arrived from the UK, took over command. December proved to be a tense month, as civil war broke out in Athens. Fortunately, it did not spill over into Salonika and 9 Commando returned to Italy in February, 1945, when the political situation had settled down. On March 14, 1945, No 9 Commando rejoined the brigade, which by then had the Partisan 28 Garibaldi Brigade under command. 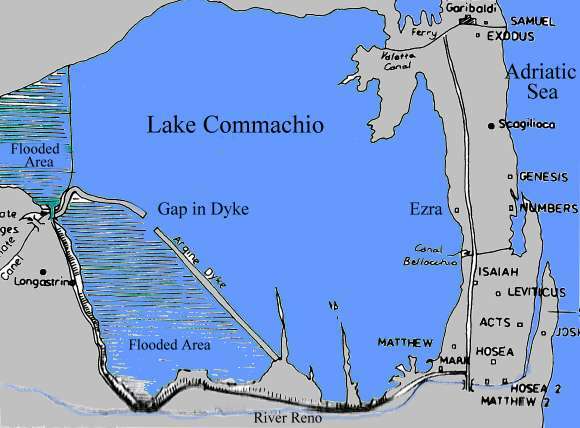 For what turned out to be their last mission, the Commando was to seize a spit of land running between Lake Commachio and the sea and to tie down enemy forces in the area, while the main force tackled the Argenta Gap. They were to approach the south western half of the spit by crossing the lake. When this had been cleared, and subject to other units clearing areas to the north, No 9 would pass though and capture Porto Garibaldi. As darkness fell, the LVTs formed up on the lake but became bogged down in mud. With the hot weather, the water level had fallen well below normal levels. Navigation on the lake was difficult, since there were no features or landmarks against the flatness of the land. Navigational lights were set up across the lake to assist and artillery support was available if needed. The Commandos transferred from their LVTs to storm-boats and Goatleys amid considerable chaos. Dunning-White wanted to postpone the operation but Tod, in overall charge, decided to push on, since the same problems would present themselves again. The storm boats towed strings of Goatleys and, just before first light, No 9 Commando reported that they were coming under fire and requested that the supporting artillery lay down covering fire. By 0630 hrs, the Commando had landed. The enemy positions were well dug in with excellent camouflage. However, all but one position, codenamed Leviticus, succumbed to the attack. Leviticus resisted artillery, mortars and fighter bombers. In the afternoon, a second attack was mounted under cover of a smokescreen and with a piper playing 'The Road to the Isles.' As No 1 and 2 Troops approached at a distance of 150 yards, the smokescreen lifted and they immediately came under heavy Spandau machine gun and mortar fire. The position finally fell with the capture of almost 100 prisoners. As the exhausting day was drawing to an end, Tod decided to postpone the advance to the following day. No 9 was placed in reserve. No 9 were then tasked to seize a bridge over the canal Fossa Marina, which ran from Lake Comacchio to Reno at Argenta. They landed on April 13, 1945, a little forward of 169 Brigade's position. The Buffs and Scots Guards advanced towards Fossa Marina but were held short by the enemy. No 9 Commando were ordered to pass through and seize the original objective and a hydro-electric plant. However, very heavy fire prevented them from taking the two crossing places. A second attempt the following night also failed when they found a 30 foot gap in a bridge and the canal had been drained, leaving impassable mud several feet deep. Despite these set-backs, No 9 closely observed the enemy positions and drew up an accurate plan of their disposition. This information was of great value to the 24 Guards Brigade when the enemy defences were finally overrun the following night. 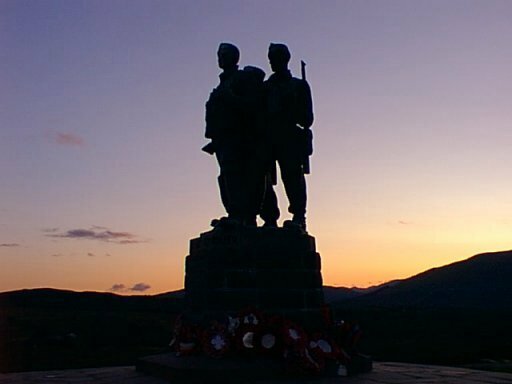 This was the last action by No 9 Commando and by mid November 1945, disbandment began when personnel, who had not already been demobilised, were sent back to their regiments. 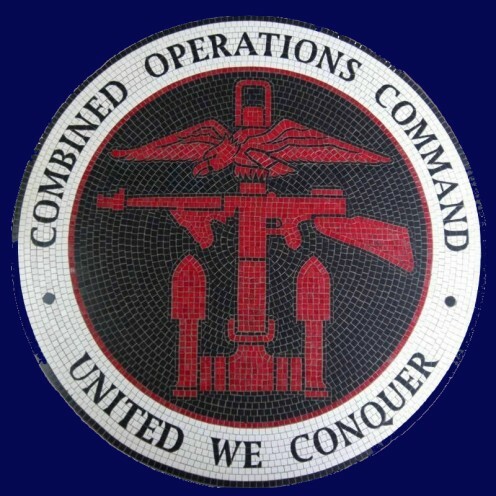 The following year, the Commando was disbanded. Ex L/Cpl X, QGM The SAS & LRDG A seminal project comprising moving stories of every Special Air Service and Long Range Desert Group casualty in WW2. All proceeds go to charities.